Wish I knew more about what is going on. The Popes plan is not clear. I understand his position as THE leader of the Church, but this issue has gone on too long. I hope that there is some planned outcome. I am totally disgusted with the blatant sinfulness and corruption in the Catholic Church. 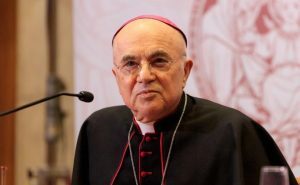 I am grateful for Archbishop Viganò and men like him who are willing to step up and tell the Truth. It seems that Satan has invaded our church and has found welcome by men who have long forgotten their vows. To hold off this vote is absurd. This must be addressed and addressed now. I fear this goes to the very top of the Vatican, and I find that disgraceful. You would think that these “Shepard’s” would realize that they will be held accountable to God, more so because they are ordained. I fear the Vatican is so corrupt that a change is needed. I think all the faithful should pray they the Holy Spirit leads these men back to the Truth of Jesus Christ, because they certainly seem to have lost it. My only solace is that Jesus said “ the gates of hell will not prevail against it.” So I will pray for our church and the souls of the men who so defile her. it is not so easy to just vote to change the universal law of the Church, as upsetting as this might seem, tgere is hope that the bishops council in rome in feb will help to address this problem with greater clarity for not just the church in the United States but around the world. Previous post: The Bible out of Context: “Saved by Faith Alone”?